Rebecca Kiss/Photography Editor The Art of Science contest creates an opportunity for professors and students of science to display the beauty of their research in a friendly competition. The Art of Science contest returned for its third year with an award ceremony and reception on Thursday at the Center of Excellence. The contest aimed to allow students, faculty and staff to share their scientific research through photographs and images that may also be considered to have artistic value. According to Martha Terry, creative services manager in the Office of Research Advancement, the contest was inspired by similar contests at other universities. 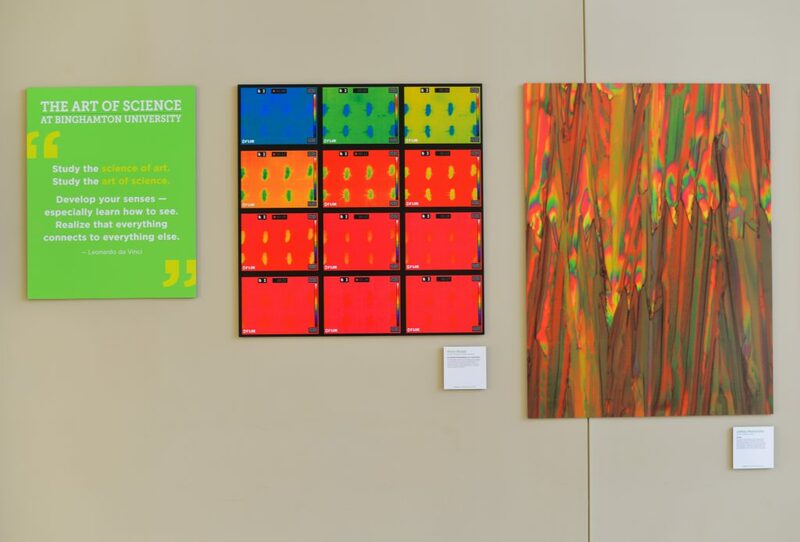 Participants were invited to translate the beauty of science into visual works, a process that has become more common due to advancements in imaging technology. The contest was divided into three categories. The first, called “The World Around Us,” consisted of images in which the subject is visible to the naked eye. The second, called “Visualizing the Unseen,” consisted of images captured with the use of optics, such as microscopes and telescopes, that extend beyond what the eye can see. The third, called “Imagining Science,” comprised images that depict objects too small to be directly visualized, models of scientific phenomena, or processes or interpretations of scientific information. The contest received 35 entries in all, with a winner being chosen from each category as well as from the entirety of the competition. Images were evaluated based on scientific significance, originality and artistic and visual impact. The prizes for winners included a drone camera kit for Best in Show as well as high-quality prints of the winning entries in each category. “Fort Anne,” an image by Michael Jacobson, research development specialist for the Office of Strategic Research Initiatives, took first place in “The World Around Us,” and was named Best in Show as well. Jacobson submitted an image of a 360-degree view of the top of Battle Hill, the location of British troops in the Battle of Fort Anne during the Revolutionary War. Having achieved the photo with Samsung 360-degree gear, Jacobson said he thought this new technology was a means of immersing the viewer in the scene and helped contribute to scientific outreach. Jeffrey Mativetsky, associate professor of physics, took first place in the “Visualizing the Unseen” category for his image titled “Shards,” depicting an organic semiconductor “ink” that dries to form crystals of varying thickness which create light interference patterns, similar to the way an oil slick forms rainbow-like bands. Congrui Jin, assistant professor of mechanical engineering, took first place in the “Imagining Science” category for “Meshed Grains,” which exhibited meshed grains of polycrystalline materials produced with a mesh generator developed by Jin’s team in order to investigate creep rupture of high-temperature components such as gas turbines and steam boilers. The entries were evaluated by a panel of five judges with expertise in various disciplines ranging from engineering to photography to art history. Wasim Ahmad, ‘04, photojournalist and adjunct professor of communications at Syracuse University, acted as a judge.